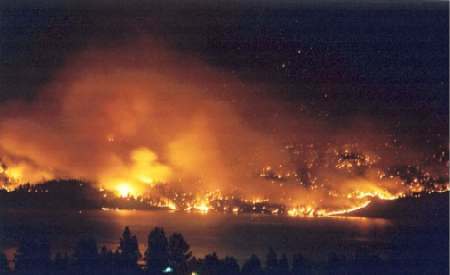 The Okanagan Mountain Park fire of August and September 2003 consumed over 25,000 hectares of forest and park land south and east of the city, forcing the evacuation of more than 27,000 people and destroying 239 homes on the southern edges of the city. The one-in-a-hundred year inferno began with a lightning strike on August 16th; the firestorm challenged personnel from over 60 fire departments across B.C., over 1,000 forestry fire fighters, contractors and loggers as well as 1,400 members of the Canadian armed forces. The Regional District of the Central Okanagan’s Emergency Response Plan was put into action and the Emergency Operations Centre at the main fire hall on Enterprise Way worked smoothly and efficiently. Inter-agency cooperation was paramount at both the EOC and at Incident Command. Our Fire Recovery Team was formed in September 2003 to spearhead community recovery efforts in the wake of the fire’s devastation. The City established a Recovery Centre office on Bernard Avenue in space donated by RBC Royal Bank, and Recovery Centre staff helped process all social service requests arising from the fire. We also established the Kelowna and Area Okanagan Fire Recovery Society to coordinate the recovery effort; working in concert with other agencies and groups, society volunteers helped rebuild lives and rebuild the community. The Recovery Society was also charged with administering the Kelowna and Area Okanagan Fire Recovery Trust Fund, a fund created by the us to assist in the rebuilding effort. Through the generosity of our community and others across the country, the Society was able to distribute $1,402,000 to those impacted by the fire. The Society’s final report to Council outlines the distribution of funds. The Society wound up its operations in April 2004, and the Recovery Centre is now closed.